This is part of a series called “4 steps to becoming a Parent Ally” The first in the series can be found right here. So, you’ve spent some time analysing the preconceptions you bring to your parenting. You’ve bought right into this idea that you want to modernise your parenting, raise empathetic children ‘cos that’s what the world needs. You’ve decided to shift the paradigm, to begin seeing your child as wholly human, fully worth of rights and respect. And yet, you keep blowing up! Melting down! Throwing a wobbly! Loosing your shiz! You’ve yelled several times, bribed at least twice and even threatened to throw a beloved My Little Pony out of the window during a harrowing car journey. I’m not talking about pamper nights and massages – although that might come up in your own self-care plan. I’m talking about seeing your well being as an utmost priority, getting a good support network for this journey ahead, and implementing The Emergency Self-care Protocol. Mamas tell me they feel selfish when they look after themselves, that taking some time to do something they love feels too indulgent. What about if it wasn’t selfish at all? What about if it was the key to being the best parent you can be? Perhaps there are other self care barriers you have to work through. 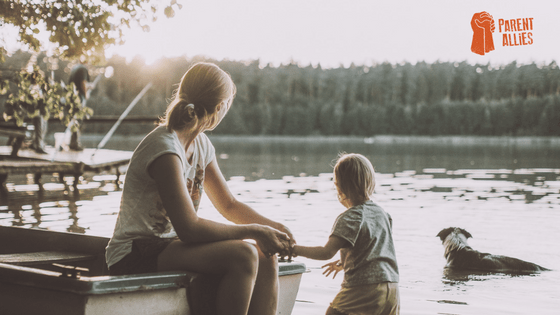 Taking 15 minutes a day and one morning a week to do something that nourishes yourself might be all you need to be the calm parent you aspire to. I know it is for me. The difference is enormous! When I am frazzled and un-nourished I am snappy and impatient. I am sure my kids can tell when I have been being loving to myself. I understand that for some parents out there this is genuinely too much to ask, even a few moments a day is a luxury unavailable to them. However, for a huge number of parents it IS a possibility, it is just we don’t prioritise it. We choose to do something more efficient, to tick something off our To Do list. What if self-care was on your to do list? What if we all saw it as one of the most effective uses of our time as parents? Take 5 minutes to scribble out all the things you love to do. They might be tiny (drink tea!) or huge (horse riding!) now sort them out – put all the little ones on a page that you can refer to – commit to doing one of these every single day. Take a look at your day and see where you can squeeze something in – there might be a car journey on the way to pick up you son from gymnastics- use it to play your favourite album or listen to a great audiobook. Put the big ones on another page and promise yourself to find a way to access them within a few months. Here are a few easy and simple self-care ideas for busy parents. Be honest too – does browsing social media make you feel nourished or empty? Are your nourishing things introverted stuff or social stuff? What did you used to love doing pre-kids? That can sometimes guide us too. When I was 20 I joined a team to take on the 12 Peaks challenge in Wales. It was a huuuuge quest – up and down mountains for 24 hours. We trained like mad but also drew around us a big team of supporters, both financial, emotional and practical. People to drop us off and bring us water and food, people to bouy us up in our training and cheerlead us through the event. Becoming a parent ally is a similar challenge! Parent allies are standing up against the status quo that would have us believe children must be controlled and punished. Gather up your support team! Do you know anyone, any family, teachers, friends or neighbours who are respectful parents? Talk to them about your desire to be an ally to your child. Find some local attachment parents on Facebook. Come and join our Parent Allies Support Group. People often say they don’t have a supportive network. If you were told it is one of the most important things for you to find, do you think that might help you prioritise the quest? I wonder if sometimes it feels frivolous, finding like-minded parents, rather than being the difference between being an ally to your child or not. Jot down any names that spring to mind that you think you could mention this too! Have a look online to see if there are local mamas in some of the respectful parenting groups you belong to. Join the Parent Allies Support Group. Marshall Rosenberg, creator of Non-violent Communication, speaking about conflict, says “Don’t just do something, stand there! !” In moments of stress we drop back into our lizard brain, we fight or flight. It’s a big problem! We need to step it up, to keep in our higher brain, and we can only do that with conscious effort. The answer isn’t to rush in with action. It is to stop, breath, stroke our evolved brains back into the game. You know what needs be a normalised parenting practice? Taking one moment in the face of stress to apply some emergency self-care. It should be standard. Imagine if, when a child yells something hurtful or breaks a favourite teapot, it was the norm to see a parent take a seat, pull in some big breaths, put a favourite song on Spotify, and then come back to the situation? (It feels radical even typing it out!) Instead, we see parents being expected to rush in, to dish out some punitive measures, to say something smart, to show they have a handle on it all. It’s too much to ask! We are just humans; fragile, triggered, frazzled people who can feel the weight of the world on our shoulders, it is highly unlikely our lizard brain is going to set us on the right path! Just pause. Scan your body. Notice what’s going on – heart pounding? Fists clenched? Mouth desperately wanting to yell something? Keep that pause going, feel your mouth and body become still. You are not trying to override your feelings here- what you feel is real. Self-care is about allowing yourself to feel this stuff without judging yourself for it! You just don’t want to bring this baggage in to your communication with the little people entrusted to your care, hey? So do a little self-talk. “Jenny, you feel angry. You spent 2 hours tidying last night and it feels like a waste.” Just a little validation – later on you can go back and examine those feelings a little more – this examining process REALLY helps. One of the most vital things I’ve discovered this year has been my regulation tool box. This is the little basket of things that stops me exploding. We’ve all got one, we just need to discover what’s in it! Some of us are oral regulators and need to sing or shout or chew or speak out a mantra. Some of us are touch regulators – a stress ball can help, or grabbing a favourite soft blanket. Every kind of regulator has something simple they can do that will impact their stress levels fairly immediately. Even as you are reading this things might be popping into your head, things that calm you down. Here’s more on your regulation toolbox. And now step back into the situation with your children – your response will be far more likely to match up with the kind of allied parenting you aspire to. This little emergency self-care protocol will turn the points of stress or conflict in your day into opportunities to connect; both with yourself, and your children. Not only will you significantly reduce communication regrets (“I wish I didn’t shout about that”) but you will be modelling excellent non violent communication skills to your children which will set them up for their entire life. Parent allies recognise that they are extremely powerful. Their actions and words have an enormous impact on the lives of others. We understand our power, our privilege, and we want to use it in the best way, in a way that changes the world for the better. We can only do this if we look after ourselves, if we treat ourselves as we would a precious resource. I invite you to see yourself as the family’s wellspring, the water that nourishes and grows your children. You would protect that well, right? Make sure no toxic stuff gets in there, you’d keep it clear of weeds, perhaps build a little wall around it. You’d check in with it weekly, make sure it was flowing well and free of pollutants, this treasured source of life for your family. Love and respect yourself the same way. Prioritise your well-being, build your supportive community and practice self-care rituals. You are your children’s bubbling spring. Their most important resource. A treasure more precious than anything. Look after yourself. Ah, I am so glad Kate! Awesome. Literally perfect timing- I had this realisation today as I was stretching and warping our day to try and make things happen a particular way in order for me to simply eat lunch in my own time. It didn’t work and I felt sick, angry and impatient. Neither of us had a good time! I realised self care was needed to avoid me feeling like I was needing to be ‘selfish’. Powerful, simple stuff!